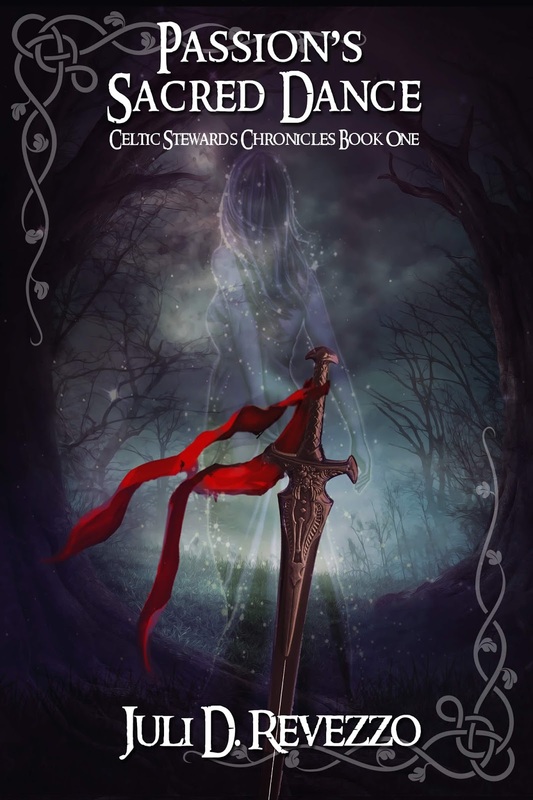 Here for your reading pleasure, is a little sample of the early chapters of PASSION’S SACRED DANCE (Celtic Stewards Chronicles, book one). Enjoy. “I suppose so,” Aaron said. Why did he feel like she scolded him? “If she does, she didn’t bring it up in our conversation,” Aaron said. Aaron opened and closed his hand. He didn’t want to picture what the world of the last thirty-seven years might’ve been like without Stacy in it. Stacy tapped the pen against the documents, leaving barely visible black marks here and there on his note. I think our family was right about you, Stacy Macken. Keep this number handy. It may be of use to you soon. Meanwhile, if you have any questions, please call. Re-reading his note, she assumed he meant the number he’d written at the bottom, a sequence resembling a foreign phone number. Their conversation wouldn’t leave her mind and she knew she needed to call him. Silly as it seemed. She plucked up the receiver and tapped in the digits. The line rang and she waited. Who was this Aaron Fielding? Was he another buyer hoping to persuade her to sell the Bitter Thorn Grove History Center to him? Given that ridiculously large tip he’d handed the clerk in their gift shop today, he could afford it. With her beloved history center facing foreclosure, she’d consider almost anything to save it. Unfortunately, the city didn’t want the place. The city fathers claimed they understood its importance, but not enough to approve her request for more money. The arts council already thought they spent too much every year. Too much? The historical records alone were priceless. A curse escaped her lips and she clenched her skirt in her fists. If this call offered her an out, it’d be worth it. Everything depended on what plans Mr. Fielding had for the center. She wouldn’t give up Bitter Thorn Grove History Center to someone who might plow it under to build another shopping mall. It wouldn’t bother her if it were for a better cause, like a new branch of the hospital or an elementary school. For that, she might agree. On second thought, maybe she could talk him into loaning her the money she needed, if nothing else. Was that why he’d come by? She needed time to clear her head and think. Air. Quiet. She pushed away from the desk and pulled her coat from the back of the chair. Peering out the window into the dark night, she noticed frost dusted the glass. Disgusted with her whole day, and the unusually cold winter, Stacy changed her mind and tossed her coat down. Family legend said it had happened before. Working on the bank’s proposal wasn’t enough to distract her from her worry. Stacy gave up trying to get any work done tonight. She needed something to take her mind off Aaron, the weather, and especially the family legend. Peering out the office door into the center’s main hallway, she could see a member of the staff attempting to straighten a new portrait of the mayor. Off in the distance, the guard’s footsteps echoed through the halls. The squeak of a door drew her attention away from him, and she spied her assistants, Hannah and Melody, carrying an empty pedestal toward the storeroom. “We just locked the front doors, but there are still a couple of students milling around the courtyard, slurping up coffee,” Hannah said. Stacy nodded then strode into the main gallery, past statues of a few founding fathers, paintings of historical incidents, and cabinets displaying the city charters and noteworthy proclamations. Slipping through a door at the far end of the room, she entered the courtyard. Despite the chill air, Stacy spied a few tattooed men and women gathered around a small table, discussing a class while nursing cups of coffee. One woman sitting with them had silvery gray eyes that shone like beacons. Hard to miss. Stacy stared at her a moment longer, trying to figure out the nature of the color. Putting the woman’s eye color down to a set of extremely cool contacts, she smiled and gave the woman a jaunty salute then reached out for the empty glasses lining the next abandoned table. Uncomfortable, Stacy strode to the far side of the courtyard to escape the woman’s scrutiny. Something told her to look back. The woman with the startling eyes stood right behind her, glaring. Her eyes glowed like quicksilver. Miss Silver Eyes smelled of patchouli, musk, and some other strange scent Stacy couldn’t identify. Harshad? How did she know about harshads? Had the long-awaited war truly come, then? Stacy stared as impossibly long incisors slid down from the woman’s gums like snake fangs. Miss Silver Eyes clamped a hand around her upper arm. The woman’s steely gaze, the ruby and alligator’s tooth earring glittering in her right earlobe, and the dark threat mesmerized Stacy. “You won’t if I have anything to say about it.” A cool male voice brought the silver-eyed woman up short and the fog lifted from Stacy’s mind. Aaron Fielding stood before her dressed in casual jeans and a gray, cable knit sweater. He seemed right at home here among the students, and yet somehow he also stood apart. The air shifted. Stacy could have sworn his leather coat, for just an instant, took on the shape of a golden eagle’s wings. A high-pitched whine scraped from the silver-eyed woman’s throat. Taking Aaron in, she cocked her head. A bemused smile spread across her face, as if at some private joke. Aaron retrieved an item from his coat. At first, Stacy thought the object might be a baton. A hint of blue light flickered between his fingers, barely there; almost hidden by the glare of the courtyard lights. Then the object changed shape and substance, wood to steel. The innocuous baton became a sword. “Now, wait!” Stacy jumped to her feet and caught the baton before it bashed the woman’s face in. Miss Silver Eyes screamed. Steel glinted from her fists as she rushed headlong at Aaron. He raised the weapon while muttering something in a foreign language. An explosion of light split the air. A blue starburst flashed at the edges of Stacy’s vision. Cringing and blinking in the brightness, she saw that the woman, hands outstretched, had gone utterly still. Stacy frowned as she studied the woman, wondering what happened. Aaron turned back to the silver-eyed woman, grasped her arm, and whispered in her ear. Her feet began to move, one step, then another, as a zombie might—unseeing and stiff in posture. Aaron kept a hand on her back, leading her to the entrance. He opened the gate and shoved her through, then slammed it shut with an Irish curse. He proceeded to mutter something, tracing a finger along the gate’s edge. His words reminded Stacy of something out of Chaucer. Azure light danced around the gate’s perimeter. Surprised to see his medallion glowing with a soft reddish-golden light and his eyes an unearthly shade of green, Stacy gasped. His gaze came back to hers. The glow in his eyes was gone. Had she hallucinated? Shaking, she recalled the fables she’d heard all her life about women and fated love with mystery men. Was the tale just the stuff of silly bedtime stories? Was Aaron merely defending her from an attacker as any gentleman might? Or did his purpose spring from something other than chivalry? Safeguards? Stacy couldn’t believe her ears. Work to restore the safeguards? Oh, God. Oh, God! Why now? Would that her whole life could’ve passed without having to hear those words. Yet, she knew what he said was true, and reached out to him. Stacy’s breath caught in her throat as he raised her hands to his biceps. His expression held a combination of intensity and passion. Her heart raced. The lights at the corners of the courtyard flared. Digging her nails into Aaron’s arms, Stacy squinted. They glided upward, and she looked down, disbelieving what she saw. They floated above the floor as if they’d become no more than a puff of smoke. The puff thinned, stretched out in the light, blinding her as it blended along the spectrum. A thin whining sound screamed in her ear. She shot along its frequency, until she felt she was one with the universal energy pulsing through her, until all she saw turned to white darkness that seemed to go on forever. If you’d like to read more, PASSION’S SACRED DANCE is available at Amazon (in Kindle Select so you may borrow it with a Prime membership) and in paperback.